This easy balsamic strawberry asparagus recipe turns cheap balsamic vinegar into a sweet syrup to drizzle on roasted asparagus with strawberries and basil. This time of year we go through at least a pound of asparagus a week. We love roasted asparagus, simply tossed with a little olive oil, salt and pepper, maybe topped with a poached egg or garlic and lemon zest. We love asparagus wrapped in other foods like prosciutto or puff pastry. 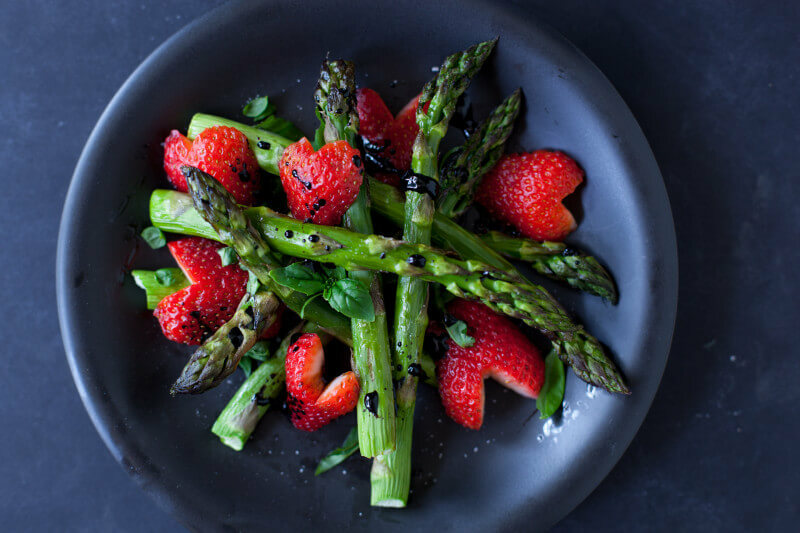 But our current favorite asparagus recipe features two favorites from our spring garden: juicy sweet strawberries and fragrant fresh basil. You can use grilled asparagus, which is really nice on a hot day, or baked asparagus. Either way, cooking it only takes 3-10 minutes, which makes this a really easy side dish with such a surprising flavor and color combo, people won’t notice how simple it really is. Oh, and my toddler LOVES it. Score one for mommy in the kitchen! The recipe below calls for roasting the asparagus in the oven. But you can grill it and it will actually cook faster and give another flavor profile to the dish. Simply drizzle the asparagus with the olive oil, and cook on a gas grill on high heat for about 3 minutes, until just tender and a nice bright green. You can also use a charcoal grill but it will probably be about five minutes. Need an idea for an affordable gas grill? We have this nice little starter model that’s just $100. We’ve been cooking with charcoal for the past 8 years so we are still on a learning curve for gas, but the asparagus is super easy to grill and we love how fast it is to make as a last minute side dish. One of the other great things about this recipe, besides the STUNNING presentation and easy prep, is that you can use really cheap balsamic vinegar. I have a small bottle of sweet, high quality, barrel aged balsamic vinegar that I use for dipping bread or topping off berries. But I also have a gallon of the cheap stuff that I got for 4 bucks. Notice how the reduced syrup has some chunks in it? That’s just because I didn’t stir the vinegar as it boiled. You can avoid the chunks if you stir the vinegar instead of realizing your two year old son is “helping” with laundry and you need to go rescue his 4 month old sister. Which reminds me, I’ve really been having fun with Instagram lately, trying out some microblogging with a combination of food fun and kid mischief. I’d love to connect on Instagram if you’re on there! 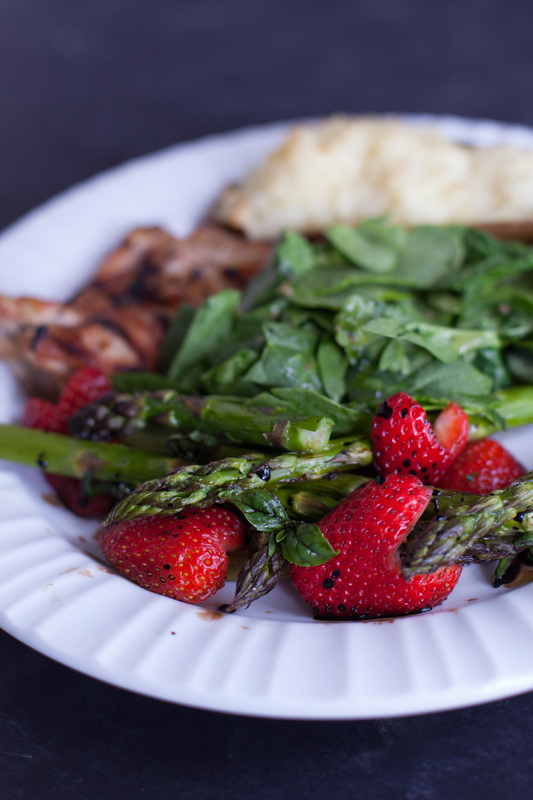 The last money saving tip I have for the balsamic strawberry asparagus recipe is to grow your own basil. It’s an easy herb to grow your self because it lets you know as soon as it needs watering and can be very prolific as long as you harvest it regularly. I have grown it in the windowsill in both water and soil, and currently have several plants thriving in my garden. If you’re new to growing your own herbs, definitely check out my post on the top herbs to grow yourself. It’s so much cheaper to grow them yourself, and quite rewarding! While the asparagus is roasting, boil the balsamic vinegar until reduced to about 1/4 cup. Approximate cost/serving: This is especially cheap if you grow your own basil and strawberries, or you can also get your berries in season at a local farm. We got our asparagus at Costco for a great price, and often see them on sale at our local grocery store this time of year. The whole recipe cost me about $7 to make (buying the strawberries but using my basil) and came out to just $1.17 per serving. The recipe starts off great, then it turns into how to turn cheap balsamic vinegar to the best, I was still interested but not as satisfied because it just seemed to jump more into the balsamic vinegar. Hi Christina, thanks for the feedback! Feel free to skip those steps if you already have a balsamic vinegar you love!